Can You Put Bleach in a Stainless Steel Sink? As its name suggests, stainless steel is a stain-repellent building material. Because of this, it is commonly used to make kitchen sinks. One downside to having a stainless steel sink it that it is relatively soft and easy to scratch, which means that you need to avoid using harsh chemicals to clean it. 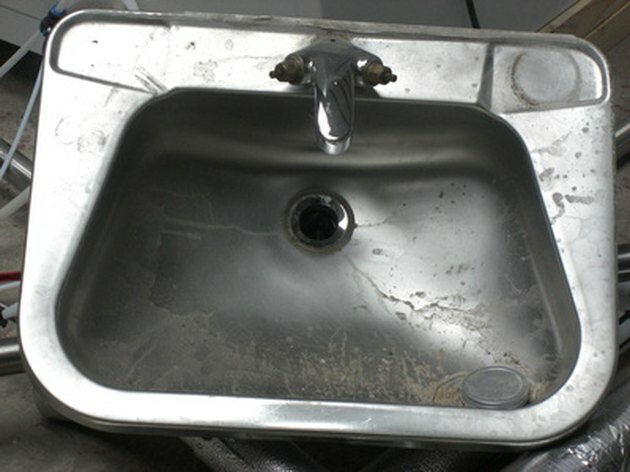 Chemicals such as bleach can permanently damage the stainless steel sink. Do not put bleach on stainless steel sinks. Bleach is a very strong chemical cleaner that can etch the surface of stainless steel sinks, which is because bleach wears down the nickel, chromium and steel in the stainless steel sinks. Corrosion like this, however, only happens after repeated bleach use. Bleach can also change your stainless steel sink's color the same way it lightens fabric. Again, this type of chemical change occurs at the uppermost layer of the stainless steel. Additionally, it will only happen if you repeatedly use bleach in your stainless steel sink. Instead of using bleach to clean your stainless steel sink, use household cleaners that will not damage its surface or color. Baking soda is one of these cleaners. Baking soda will absorb stains and can act as a mild abrasive powder that will gently grind away stains. To use it, make a thick paste of baking soda and water. Apply the paste to the entire sink, and rub it until it is clean and bright. Rinse with cold water and dry the sink thoroughly to prevent water marks. You can use household distilled white vinegar to clean light stains on your stainless steel sink. The vinegar will also neutralize smells that the sink might have absorbed. To use it, apply the vinegar to the stain with a clean cloth. Rub it until you've removed the stain, and rinse the entire sink with clear water. Dry it with a clean cloth so that streaks don't develop.